Stock # LA015132, Premium Unleaded V-6 3.5 L/211, Automatic, 11870 mi. Very Nice, L/ Certified, GREAT MILES 11,862! NAV, Sunroof, Heated/Cooled Leather Seats, Satellite Radio, Onboard Communications System, iPod/MP3 Input, Back-Up Camera, INTUITIVE PARK ASSIST (IPA), Alloy Wheels. SEE MORE! Leather Seats, Navigation, Sunroof, Heated Driver Seat, Cooled Driver Seat, Back-Up Camera, Satellite Radio, iPod/MP3 Input, Onboard Communications System, Aluminum Wheels, Keyless Start, Dual Zone A/C, Blind Spot Monitor, Cross-Traffic Alert, Brake Actuated Limited Slip Differential. Rear Spoiler, MP3 Player, Remote Trunk Release, Keyless Entry, Child Safety Locks. MARK LEVINSON PREMIUM SURROUND SOUND AUDIO SYSTEM 17 Green Edge speakers, Class D digital amplifier w/ultra-low crossover distortion, 835 watts of continuous power at less than 0.1% Total Harmonic Distortion (THD), 7.1-channel speaker architecture, DVD video capability and Clari-Fi technology, INTUITIVE PARK ASSIST (IPA), F SPORT PERFORATED LEATHER HEATED STEERING WHEEL. 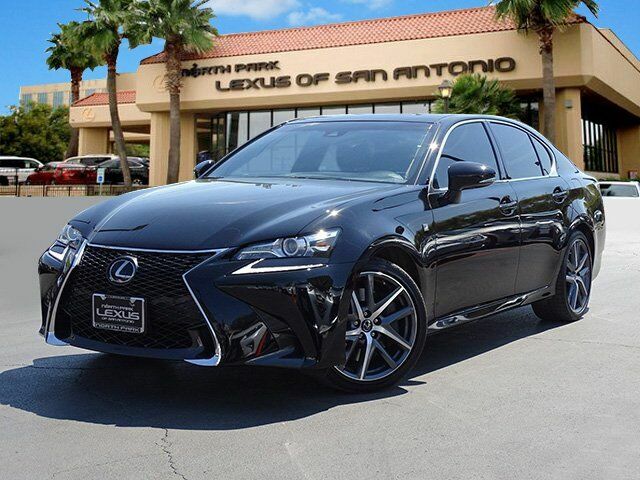 Lexus GS 350 F Sport with Obsidian exterior and Rioja Red interior features a V6 Cylinder Engine with 311 HP at 6400 RPM*. Maintenance Up To Date, 161 Point Inspected, CARFAX Certified One Owner, LOW MILES! Clean CarFax! Very Clean Vehicle! Great color! Blind Spot Monitor newCarTestDrive.com's review says "Overall the cabin is elegant, warm and inviting, thanks a lot to soft ambient lighting around the edges. And the materials are a cut above those in the German luxury sedans, with padded leather panels and wood trim in rich shades. ".